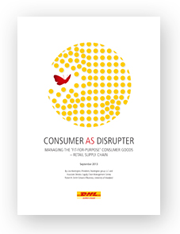 Thank you for your interest in our latest report, Consumer as Disrupter – managing the “fit-for-purpose” retail and consumer goods supply chain. To download your copy, please complete the brief form. Consumer demand is volatile. It’s also often insatiable. Almost overnight, a big bang disruption can change a market landscape. For the retail and consumer goods sectors, supply chain agility is everything. Our whitepaper, developed in collaboration with Lisa Harrington, co-author of X-SCM: The New Science of X-treme Supply Chain Management, gives you the insight to understand this New World Order. Learn about the opportunity to profit in an environment of unpredictable, fast-moving change by examining flexible and shared networks, tailored sourcing, postponement, accelerated delivery and more. We hope you enjoy the whitepaper. Please feel free to contact us if you have any questions or would like to explore the concepts shared in more detail. Subscribe to Supply Chain Matters Newsletter Featuring articles on industry best practices and innovative thinking. **To receive your download, you must "Opt-In" to receive future emails from DHL Supply Chain. However, you may unsubscribe at any time. Subscribing to Supply Chain Matters is optional.